Our member and committee member Jim Manson, assisted the Ayrshire Division of Police Scotland at the Cumnock Christmas Fayre and switching on of the Christmas lights. 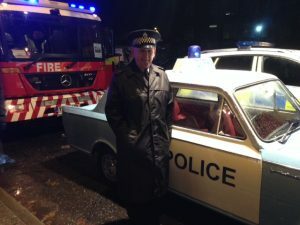 He was dressed in 1960’s uniform and drove a 1960’s Police Vauxhall Viva, courtesy of Kerr & Smith (Cumnock) Ltd.
Jim Manson remembering the ‘Good old Days’! and the good old weather! Despite the cold weather a good crowd turned out to see the vehicles on display and enjoyed the fayre.